This excellent story gave me fabulous action, a beautifully drawn world, a very memorable character right out of legend and a twist at the end that kept me thinking long after the story was over. I loved it and highly recommend!! Wow, this took me by surprise! 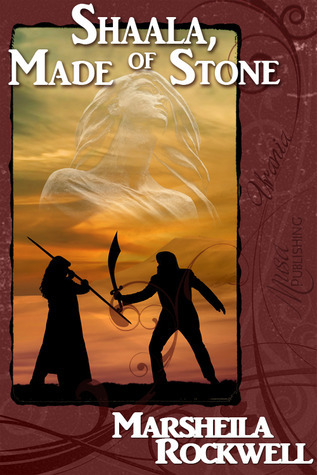 Shaala, Made of Stone is a fantasy story set in the desert about a cursed sultan's daughter turned warrior. It has great action, intrigue, and tragedy. While it's very short it is well written! Sweet. I was smiling at the end because the writing was perfect, the ending perfect. I long for more. Marsheila Rockwell - Marsheila (Marcy) Rockwell was born [redacted] years ago in America's Last, Best Place. A descendant of kings, pilgrims, Ojibwe hunters and possibly a witch or two, she spent the first few years of her life frolicking gleefully in a large backyard that is now part of one of the nation's largest Superfund sites. Perhaps that explains her early penchant for fantasy and horror - the first book she ever read (at the tender age of three) was Frank L. Baum's "Ozma of Oz. "Marcy sold her first short story to Marion Zimmer Bradley while in college and her first novel to Wizards of the Coast in 2005. She now lives in the desert in the shadow of an improbably green mountain and in odd moments stolen from her family and her writing, she can be found browsing eBay for Wonder Woman/Girl figures.